Frankly speaking, when watch a TV show or an online movie, most of users prefer to select "HD" mode. Why? This is because HD mode can display every plot in highest quality, bringing us the best watching experience. However, the high resolution, color fidelity and frame rate also result in additional storage capacity. Once you download it to your hard drive, you will see the difference evidently when compared to standard-definition video. How to make your HD videos smaller? Don't worry. Here we list top 5 HD video cutters for your reference. You can apply whichever you appreciate to remove unwanted segments and keep fantastic parts left. Free Video Cutter Joiner is ideal enough that can be adopted to either cut or merge videos efficiently. Describing it in details, you can get rid of undesired sections from your HD video and save it as WMV, MOV, VOB, AVI, MP4, FLV and 3GP. In addition, you can also combine different format videos into a new one, including MP4, AVI, FLV, WMV, MOV, VOB and MPG. Under the help of it, you can remove your misgiving of quality issue as it will produce a trimmed video with lossless quality. Furthermore, you can enjoy two different cutting modes. One is no-re-encoding mode, also seen as direct cut mode, which supports less video formats but can work at a fast speed. The other is re-encoding mode, also considered as indirect mode, which is available for nearly all video formats but accomplish cutting assignment slowly. Coming with a forthright design, Free Video Cutter is deemed as one of the simplest trimming tools. It provides you a wonderful chance to cut large HD video files to numerous small pieces. Meanwhile, it will convert the split video to other common formats, including MPEG4, DivX, WMV, MOV, FLV and MP3. 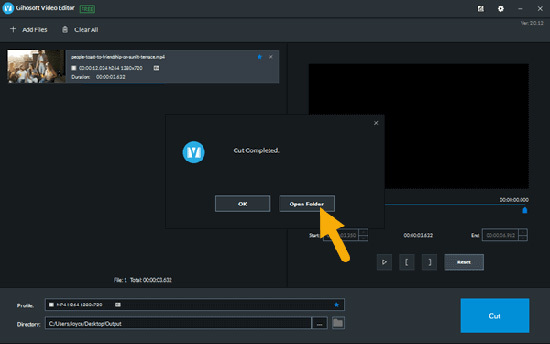 Even though there is no sound in this compact video cropper, it can allow you export the audio from your original video by choosing MP3 as your output format. One critical issue is that it will spend you much time on creating video thumbs. Hence, you'd better remember to disable this function in advance. To assist you to set the accurate cutting position for your HD video, it is well-designed with a thoughtful precision value setting, which can let you get more video clips. However, you should keep in mind that it offers no ability to adjust quality and play video for you. As another decent video cutting freeware, Weeny Free Video Cutter is fairly handy that can be used to crop large HD videos to different portions in smaller size. This tool enables you to export your destination video files as WMV, VOB, AVI, ASF, 3GP, FLV, MPG, MP4, etc. It also delivers an excellent platform for you to customize your video and audio files so that you can revise the name, change vital parameters, like frame rate, audio volume, video size, audio quality, video codec, etc. However, it is imperfect as well. From its intuitive interface, you can know that there is no extra cutting mode designed to adjust the trimming point exactly. Though you can use the slider in the timeline, it is blunt to select a cutting section. With the exception of these shortcomings, it can come in handy to give you concrete help. Customize codec, size, bitrate, etc. If you are looking for an uncomplicated trimming program to cut your HD video, Moo0 Video Cutter can be a good choice for you. It has capability to help you cut off needless segments with only satisfying parts left. Moreover, by taking the aid of it, you can extract any specific scenes from your videos. It will save the complete files in fast way on your computer. 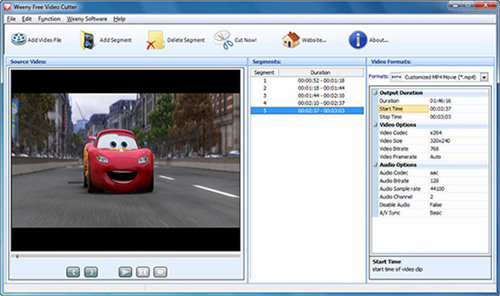 Any popular video formats can be supported, such as AVI, MKV, MOV, MP4, FLV, OGG, MPG, M4V, WEBM, WMV, etc. To facilitate you make an exact selection, it empowers you to set both start time and end time manually. Besides, from its clean operating interface, you can also see the attentive navigation tool, which is convenient for you to increase time by 1 sec, 5 sec, 30 sec and 3 min at a time. Nevertheless, you have to note that there is no entrance to change the video format as you like. At the same time, it will not show the video for you. That is to say, it is hard to control the video progress firmly at all times. As its name suggests, Gihosoft Free Video Cutter is a dedicated video trimmer that is specialized in cutting videos. Aside from this function, you can utilize to do nothing. Regardless of its single feature, it can do a good job for you actually. You can import different videos of diverse formats, for instance, AVI, MPEG, MOV, MPG, VOB, RM, ASF, WMV, MKV, FLV, MP4, etc., into this intelligent video splitter. Most importantly, it can sort out your HD videos by leaving out unwanted fragments. You can strictly control every second by yourself. Only when you get a new video file can you find the fact that there is no quality loss after cutting process. Developed with no more advanced functions, Gihosoft Free Video Cutter can be a suitable tool for newbie. These video cutting programs are good at processing your large HD videos in smaller size. The most delighting point is that you can try any one without paying for it. Surely, you can only have a basic learning about them. If you wonder which one is the best free HD video cutter, you should judge it by yourself. Supposing that you wanna customize some cutting parameters for your required HD vides, you can try Weeny Free Video Cutter. Alternatively, Free Video Cutter Video is also a wonderful option to split HD videos in different modes and join various videos with distinct formats into one. However, if you'd like to ask more powerful HD video cutter for help, you cannot miss an outstanding opportunity to know Joyoshare Media Cutter. It can play an essential role in cutting HD videos at up to 60X faster speed. 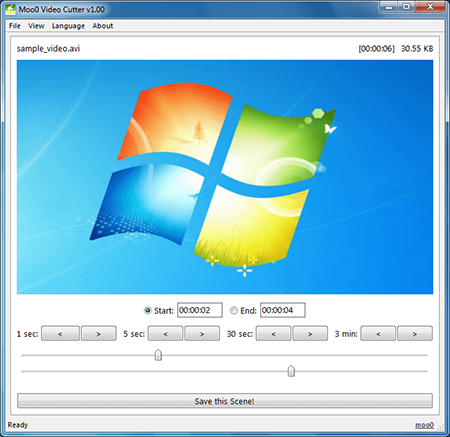 Apart from it, you can also be authorized to extract audio from your HD video without damaging original quality. To see what it can do for you, you can move to its free trial.